This hike was an approximately 5 mile easy counter-clockwise loop hike in San Tan Mountain Regional Park just south of Queen Creek, AZ. (Easy, except for the late summer heat.) 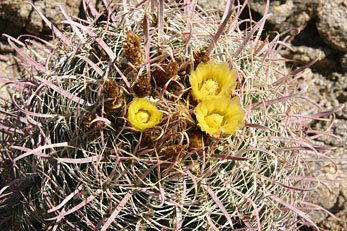 The hike loops around the unnamed central mountains of the park using the Moonlight, San Tan and Hedgehog trails. 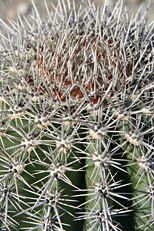 This photo gallery is mostly about cactus. 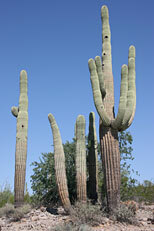 Young and old Saguaro Cactus (Carnegiea gigantea). 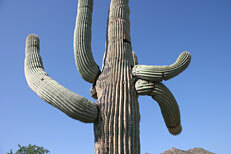 The iconic cactus of the Sonoran Desert. 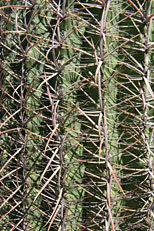 Dense spines of a young Saguaro Cactus (Carnegiea gigantea). 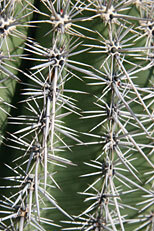 Close up of the spines along the ribs of a yound Saguaro Cactus (Carnegiea gigantea). 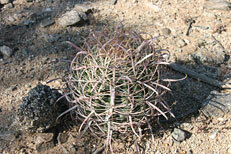 A young California Barrel Cactus (Ferocactus cylindraceus), is ball of spines. 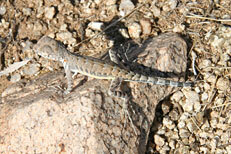 Zebra-tailed Lizard (Callisaurus draconoides). This species will often arch its tail over its back and sway it back and forth showing contrasting black and white strips on the underside of the tail. 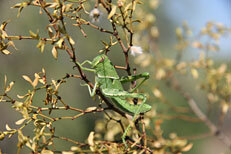 Green grasshopper in Creosote Bush (Larrea tridentata). 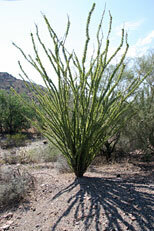 Another classic Sonoran Desert plant is the Ocotillo (Fouquieria splendens). 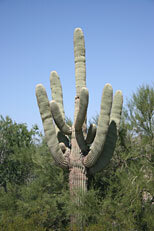 In hot dry conditions it will drop its leaves. After rains come the canes will leaf out once again. In the spring bright orange flowers adorn the tip of the branches. 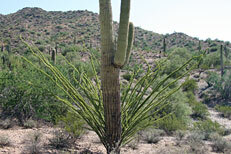 Ocotillo (Fouquieria splendens) tries its best to hide behind a Saguaro Cactus (Carnegiea gigantea). 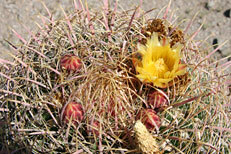 California Barrel Cactus (Ferocactus cylindraceus), blossom and buds. 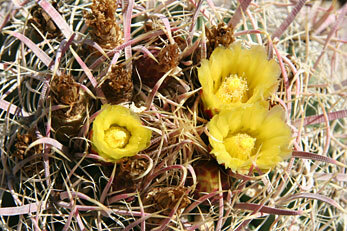 A trio of California Barrel Cactus (Ferocactus cylindraceus) blossoms. 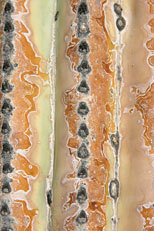 Wonderful color and pattern on Saguaro Cactus (Carnegiea gigantea). 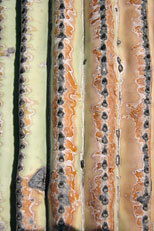 Wonderful color and pattern on Saguaro Cactus (Carnegiea gigantea). 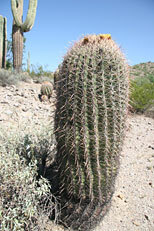 Note on this older saguaro most of the spines have been lost. 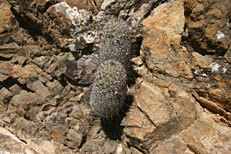 Arizona Fishhook Cactu,s aka Fishhook Pincushion Cactus (Mammillaria grahamii) somehow grows from a crack in a rock ledge. 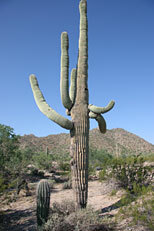 A grand odl Saguaro Cactus (Carnegiea gigantea) rises above the trees at the edge of a dry wash.